3-0 win over Laos on Tuesday may not be enough to save former AC Milan and Juventus boss. Worry is that if performances don't improve rapidly the target of reaching the Asian Cup final, on home soil next year, will impossible to achieve. LONDON: UAE coach Alberto Zaccheroni will learn in the next few days whether he is to lead the country into next year’s Asian Cup on home soil, a UAE FA official has told Arab News. Despite Tuesday’s 3-0 win over lowly Laos during the team’s Spanish training camp, question marks still hang over “Zac.” Disquiet has been growing in Abu Dhabi over the record of the experienced Italian, appointed last October, ahead of the 24-team continental tournament that kicks off in January. Before Tuesday’s victory over the Southeast Asians, ranked 178th in the world, the Whites had lost four and drawn one of their previous five matches and scored just three goals in 11 under the 65-year-old. After reports of player unrest and frustration about the Italian’s beloved 3-4-3 formation, Zaccheroni caved into the pressure and went with a 4-2-3-1 over Laos. Omar Abdulrahman and Ali Mabkhout, the team’s stars who had been punished for reportedly breaking a team curfew in January, returned and both found the net to ensure that the team scored more than one for the first time under Zaccheroni. There are divisions within the UAE FA about whether the former Inter Milan and Juventus boss, who won the 2011 Asian Cup with Japan and left Tokyo after a disappointing performance in the 2014 World Cup, deserves to stay on until January. But what is not in doubt is that his future currently hangs by a thread. 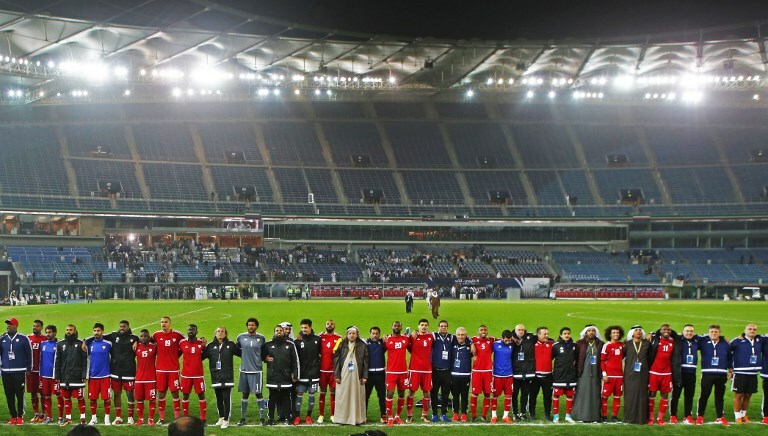 “Anyone can see that results have been poor but performances have too often been really poor,” an official at the UAE FA told Arab News, adding that the target for the Asian Cup is to make the final, as the team did in 1996 when they last hosted the tournament. The UAE in happier times, just after their victory in the Gulf Cup semifinal. Since the end of that tournament they have gone on to win only once and lost three of their five matches. The 2-0 loss to Trinidad and Tobago in Spain in the previous week was a dismal effort, and it followed a goalless draw with Andorra and a loss to Gabon. After such a string of results, the Laos win was welcome for the coach who won the Serie A title with AC Milan in 1999. “There are still discussions to be held about the recent results because if there is to be a change, it has to be soon,” added the official. Speculation has increased to the point that the names of other coaches have been thrown into the ring. Al-Ain boss Zoran Mamic has been linked with the job but distanced himself from the hot-seat. “I am extremely flattered and honored that my name is mentioned in connection to the UAE head coach,” Mamic wrote on social media. Former Al-Jazira boss Henk ten Cate has been another name added to the mix after the success the Dutchman had at club level. Rui Faria, Jose Mourinho’s former assistant at Manchester United, Real Madrid and Inter Milan, has also been mentioned. Publicly the UAE FA has been quick to back Zaccheroni, even if there is huge disquiet behind the scenes. “The UAE Football Association denies what is being circulated in the media and social networking sites about communicating with any coach to take over for the Asian Cup,” a statement read. For Zaccheroni’s part, he proclaimed that he was satisfied with the Spanish training camp. “The objective of these friendly matches is to develop the positives and address any negatives so we can avoid them in future,” he said. It remains to be seen if Zaccheroni is in charge when the national team returns to Spain next month for another training camp and tougher tests against Honduras and Venezuela. The UAE kick off the Asian Cup on Jan. 5 against Bahrain in Abu Dhabi.